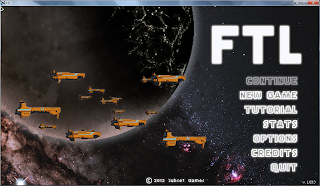 Maybe not even a roguelike, at least not a traditional one, but it's not like I've played any new ones in the recent months, so FTL: Faster Than Light will have to suffice. And it certainly has the appropriate difficulty. Though I did beat it in less than a week's time (on Normal). At first, the game's overly random nature seemed unnecessarily cruel and unforgiving. I felt that I too rarely came out as a winner from events and fights without losing something. 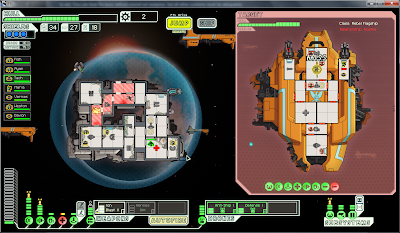 Bit by bit I learned to deal with the randomness, although I didn't get real success in the game until I unlocked the Engi ship. With the starting ship's default weapons, you have to wait a good while before you can fire. 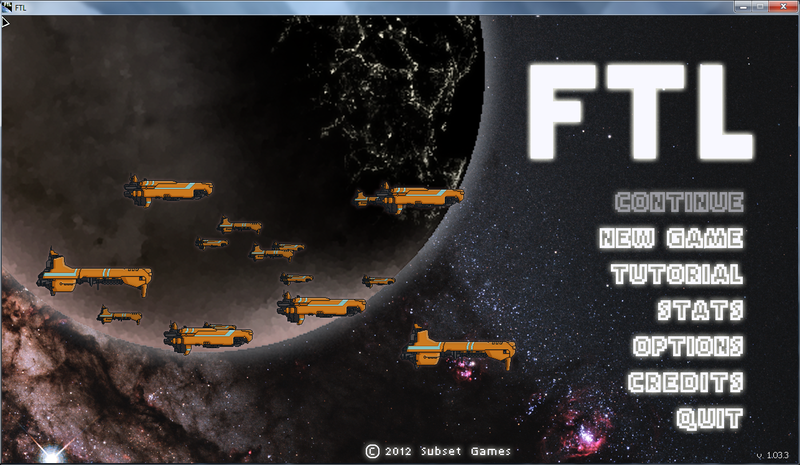 And when the guns are finally charged, the enemy ship is ready to fire as well. Multiple times I drooled over the alpha strike augment (Weapon Pre-Igniter) in a store but never had the required 120 scraps to buy it. Everything changed with the Torus and its fast-firing ion blaster. I would often win battles with the mere cost of one drone part. While the Engi ship has its own disadvantages, I found it much better than the Kestrel. And eventually I got to the final sector and the last stand against the rebel flagship. The encounter was quite intimidating, but in the end, I prevailed. My victory was rather short-lived, however, as instead of blowing up, the rebel flagship merely shed some of its parts and jumped away! Unfortunately I had spent my last drone parts in the first phase and there was no repair beacon to jump to for restocking. 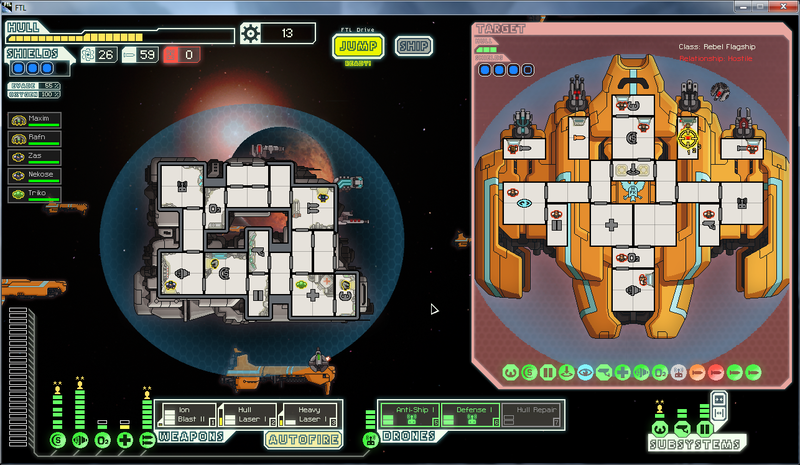 I really stood no chance in the second phase; the enemy bees tore my ship apart in no time. After a fair number of attempts, I finally got to the flagship again. This time my Torus wasn't as strong in avoidance but I had more crew members, drone parts, and -- most importantly --a teleporter to board the flagship's weapon systems. The first phase was very easy now that I was familiar with it. The second one got hectic during the power surges, though. At least no enemy boarding drones got on my ship. Of course, there still had to be a third phase after that but this time I wasn't as surprised to see the flagship jump away. The very last fight was a challenge but my ion blaster kept the flagship's shields suppressed (surprisingly well, really) and the trusty anti-ship drone did its job. I learned to like the game quite a bit more than I initially did. I doubt I will revisit the game any time soon, however -- I'm quite satisfied with my victory for the time being. I would've liked to use more of the beam weapons, though; they're pretty cool. Too bad you have to put so much effort (and luck) into making them work since they're so easily negated with shields. Pretty good game. And the soundtrack is splendid, too.